Saturday afternoon at 1:00 sharp, the captains of the contrade oversaw the assignation of the horses. The crowd was thick! This is when the contrade luck can be won or lost depending on what horse is drawn! All of the horses enter the Piazza in order of their number and those that have been chosen to run are siphoned off into a sort of 10-stall near where the drawing takes place, the other horses simply don’t enter this area and continue on out of the Piazza, that’s how you know who is in and out. It is all very random. The numbers from 1 to 10 are listed on a leader-board type thing. The numbers of the 10 horses chosen to run in the Palio are then held up and individually announced to the crowd and then put into a little canister and then put into a lottery drum, spun around, and drawn out. As they are drawn out everyone scrambles at their notes to see which horse wore the number. For instance, the horse I liked best, “Lo Specialista” wore 22. The 10 names of the contrade are then put through this same sequence and it is only as the get drawn from the drum that they know with which horse they are paired. As each horse and contrada are paired, a “delegation” from the respective contrade comes and collects the horse and marches him out of the Piazza, chanting the whole way! The whole thing took exactly half an hour. The contrade chant is interesting. It is the same rhythm / drum beat for all the contrade but the words are slightly different. It can be both wonderfully traditional and annoying, depending on the time of day or night!! The horse is taken to a stable within the contrada and looked after 24 hours a day. The contrada jockey has essentially three days to get to know the horse. Several “tests” occur before the actual Palio for the jockeys to “learn” the horse on the track prior to the race. A trainer from anywhere in the country can put forth a horse to run in the Palio and the jockey can similarly be hired from anywhere in the country. I have overheard a guide saying that the wining jockey can earn 200,000-300,000 Euro and that second place earns nothing. I am not sure if any of that is fact, though. 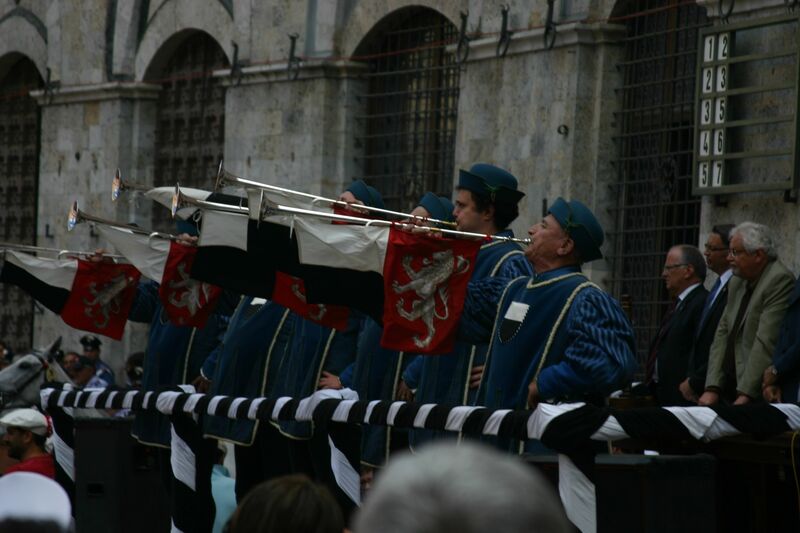 This entry was posted in Contrada, Italian language school, Siena and tagged contrada, contrade, Il Palio, Lo Specialista, Piazza del Campo, Siena, The Palio. Bookmark the permalink.